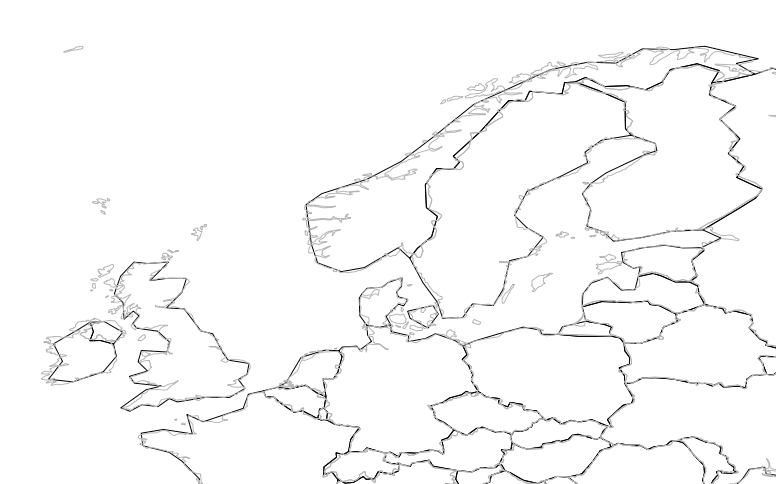 master maps: How to minify GeoJSON files? You can't do web mapping these days without knowing your GeoJSON. It's the vector format of choice among popular mapping libraries like Leaflet, D3.js and Polymaps. Size matters on the web, especially if you want to distribute complex geometries, like the world's countries. The challenge is even bigger if you want to target mobile users - or support web browsers with poor vector handling (IE < 9). This blog post will show you how to minify your GeoJSON files before sending them over the wire. The first thing you should do is to generalize your vectors so they don't contain more detail than you need. In a previous blog post, I was able to remove 90% of the coordinates without loosing to much detail for map scale I wanted to use. This will of course have a great effect on the file size. 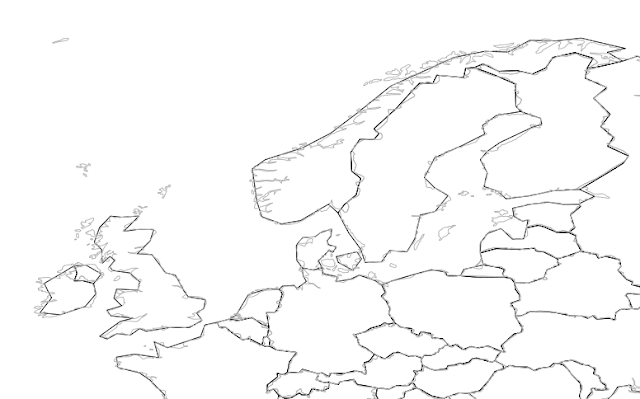 The 110m and 50m country polygons shown in QGIS. Let's open the datasets in QGIS. If you look at the attribute table you'll see that each dataset contains 63 attributes, which makes them very versatile. For your web maps, you probably need just a few of the attributes, and you should remove the ones you don't need. I'm keeping the country name and the ISO 3166-1 country codes (alpha-2, alpha-3, and numeric), which can be used to link country geometries to statistical data. Only keep the attributes you need. The important thing is that I'm only keeping one decimal (coordinate precision) for the 110m dataset, and two decimals for the 50m dataset, which is sufficient for my map scales. This will reduce the size of the GeoJSON files by more than half. The size of the 110m GeoJSON is now 207 kB and the 50m version is 1,897 kB. But we can do better. This will remove all whitespace which is not succeeding a letter or a dot, which are present in country names. Remove line breaks (keeping some for readability). This will reduce the file size of the 110m GeoJSON from 207 to 156 kB, without loosing any data quality. More than 400k of whitespace characters was removed from the 50m GeoJSON file, reducing the file size from 1,897 to 1,481 kB. If your web server is supporting gzipping on-the-fly, the 110m GeoJSON will end up being 45 kB and the 50m version will be 430 kB. Not bad! And if this is too much work, you can always download the final GeoJSON files on thematicmapping.org. NB! Mike Bostock’s TopoJSON would allow us to compress the GeoJSON even more, while preserving topology (shared borders between countries) - but we would need to use a map client supporting the format. Looks promising! Using the regular expressions like that can easily break your labels or attributes. I would suggest to use a json parser that supports minification to remove white space. - removing invisible geometries, if the simplification process did not already. - reducing the output precision of float coordinates according to the desired zoom level. - use shorter ids for all attributes. I agree that I could also use a JSON parsers for minification, but I wanted more control to keep each country on a separate line for readability. > removing invisible geometries, if the simplification process did not already. The geometries is already simplified for the targeted map scale (maybe the 50m version could be a bit more simplified). > reducing the output precision of float coordinates according to the desired zoom level. I'm already doing this by only keeping one decimal for the 110m dataset, and two for 50m. > use shorter ids for all attributes. I've been playing with ogr2ogr to convert shapefiles to GeoJSON and I've used the -simplify option to reduce file size. Looking at the ogr2ogr reference I see the -lco option you've used, but where does the COORDINATE_PRECISION come from? Is there another reference I can use? Have you looked into http://en.wikipedia.org/wiki/Ramer%E2%80%93Douglas%E2%80%93Peucker_algorithm for possibly reducing the number of useful points? One more thing which will really help, is gzipping the JSON as you server it from your server. I've seen that Gzipping in itself provides upto 70% in bandwidth decreases. Eli: COORDINATE_PRECISION is documented here. I've fixed the TopoJSON url. Thanks! Devdatta: Yes, I'm mentioning gzipping which also gives me a 70% reduction. Thanks for the link to the minified dataset! Much appreciated. 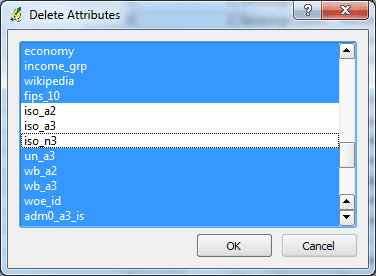 It takes an input GeoJSON and removes every attribute except the country IDs and names.